Every time I think I know what Jim Carrey will do next as a comedian the actor throws me off balance. Think of his new HBO series Kidding. But most of all, his evolution as a no-holds-barred political artist just blows me away. 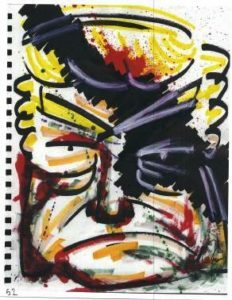 I recently was privileged to see more than 80 of his sketches at the Maccarone Gallery in Los Angeles, “IndigNation: Political Cartoons by Jim Carrey, 2016–2018.” This Canadian actor is fearless in attacking the dysfunction of Trump’s presidency. The intensity of his aversion for Trump is felt pulsating through the 8 1/2 x 11 school notebook pages literally ripped from the binder. The torn, ragged edge of each sheet is perhaps a metaphor for how Carrey feels while painting with brush markers and acrylics, often in exceptionally fine detail. 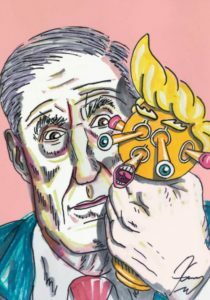 But it is only since January 2017 that we have seen how accomplished his artistic talents are, as he reacts with outrage to what Trump has done. Our Ally. Our Missile. Our Crime. I hope that the IndigNation exhibit will travel throughout the country so that followers of Carrey will see for themselves how irrepressible these drawings are. Truly turbocharged fulminations of our times. Note: “IndigNation: Political Cartoons by Jim Carrey, 2016–2018” was on view at Maccarone, 300 South Mission Road, Los Angeles, October 13–December 7, 2018.